So asthma has been a long-standing problem where people suffer from shortness of breath. They either wheeze or have episodes of repeated coughing. These symptoms normally occur with a cold virus irritating the lungs, or if they are around with someone who is smoking. It is possible too that their allergies are too bad or they have been in constant fatigue for a long time. These symptoms will continue until they take a rescue a medicine that can calm down the lungs. Asthma is a controllable condition. Indeed, for many patients, control is very effective that it amounts to a virtual care. But asthma is NOT curable in the same way as, say, bacterial infections. It never really goes away. Also, there is no single cure that would ever suffice. It’s getting clear that there are several kinds of asthma and each one differ greatly when it comes to presentation and genesis. To understand asthma, it helps to know more about how the airways work. These are tubes that bring air in and out of the lungs. Asthmatic patients have inflamed airways. They are swollen and very sensitive, hence react strongly to inhaled substances. Once they react, the muscles around them contract and tighten. This causes narrowing of the airways, thus causing less air to flow into the lungs. Airway cells may also produce more mucus, which is a sticky, thick liquid, adding to the narrowing of the airways. Exercise-Induced Asthma is triggered by physical exertion. Most people with asthma experience symptoms with exercise. With this type, airway narrowing usually peaks 5-20 minutes after starting the exercise, making it hard to catch your breath. They can still peak or worsen even after you have stopped exercising. Wheezing and coughing are the most common symptoms. Your physician may ask you to use an inhaler (bronchodilator) before doing such activities to prevent these symptoms from occurring. This type of asthma is called cough variant asthma because its predominant symptom is coughing. There can be several other causes like chronic rhinitis, GERD, and postnasal drip. Coughing due to sinusitis with asthma is very common. This kind is most of the time underdiagnosed, hence left untreated. Common triggers for this type of asthma are respiratory infections and exercise. You may be required to see a lung expert for further work-ups and diagnosis. This is a type of asthma occurs due to workplace triggers. Symptoms like difficulty breathing only occur during the workdays. A lot of people with this type of asthma present with a runny nose or eye irritation. Some have a cough instead of usual asthma wheezing. Common jobs associated with occupational asthma are animal breeders, painters, woodworkers, and hairdressers. Patients are being advised to wear masks and other protective gears at home to prevent triggers. Also called nocturnal asthma. This type is very common. Symptoms are noticeable during sleep because asthma is being influenced greatly by the sleep-wake cycle or circadian pattern. A cough, troubled breathing, and wheezing are common and dangerous, especially at night. Studies show most deaths due to asthma happens at night. It is believed that this may be due to reclining position, cooling of the airways, exposure to allergens, or even hormone secretions that follow the circadian pattern. Some researches formulated the hygiene hypothesis as one of the possible causes of asthma. They think that our Western lifestyle, focusing on hygiene, has resulted in changes in our living conditions. Most kids no longer have the same types of exposure as before. This has a huge impact on how the kids’ immune system develop during childhood. There is an increased risk of atopy and asthma. Wheezing, which is a squeaky or whistling sound that is observed when you breathe. Chest tightness – A feeling that something is sitting on your chest. So many people ask, “Can asthma be cured”? The answer is NO, but it can be managed. 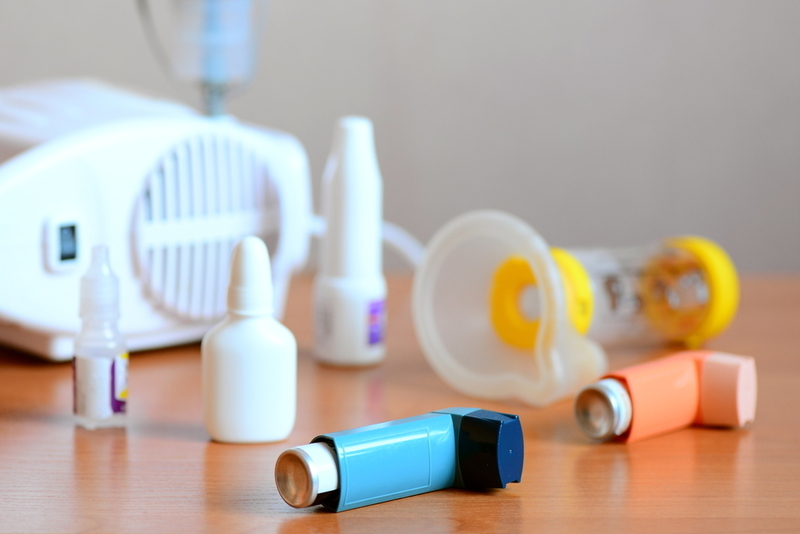 Asthma can be treated with two types of medicines – long-term control and quick-relief drugs. A lot of people take long-term control drugs every day to help avoid symptoms. These medications reduce airway inflammation but don’t give you fast relief. 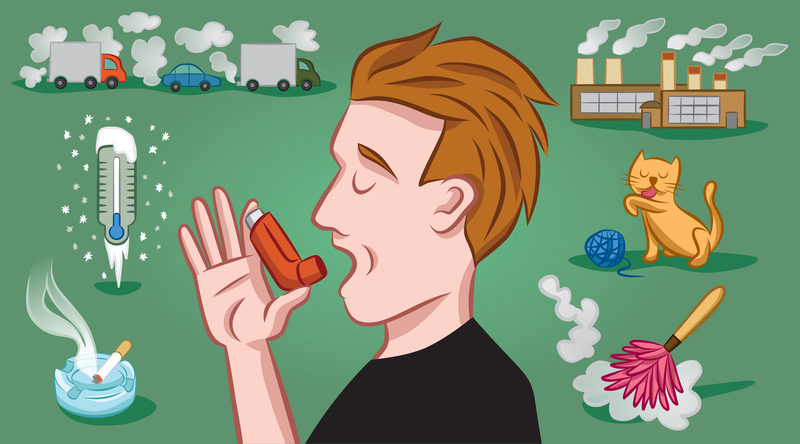 Inhaled corticosteroids are the most recommended for long-term control of asthma. They are very effective in relieving inflammation. Your doctor may initially give you a low dose inhaler, but if flare-ups occur, you will need a higher dose. These medicines are generally safe when used as prescribed. But just like many other drugs, they also have some side effects. Mouth infection or thrush is very common. You can prevent this by using a spacer on your inhaler to prevent it from landing inside your mouth. Rinsing your mouth out is also helpful. If taken for long periods of time, these medications may increase your risk for osteoporosis and cataracts. You may be given Calcium and Vitamin D as supplements. Inhaled corticosteroids are also believed to affect the growth rate of kids. Cromolyn (anti-inflammatory), which is taken using a nebulizer. This drug also prevents airway inflammation. Omalizumab (immunomodulators), which is given as a shot once or twice monthly. This prevents your body from reacting to common triggers like dust mites and pollen. But this should only be administered by a doctor as anaphylaxis may occur. An inhaled long-acting beta-2 agonist is commonly being used as adjunct therapy to inhaled corticosteroids. They help open the airways. Leukotriene modifiers are taken orally, which help blocks the chain reaction that inflames the airways. Theophylline is also taken orally, which helps open the airways. Asthmatic patients should always have quick-relief medications within their reach to avoid flaring up of symptoms. Inhaled short-acting beta 2 agonist is the first choice. They act fast and relax the tight muscles around the airways. You must not use quick-relief medicines as a substitute for long-term control medications because they do not relieve inflammation. Learning how to manage your asthma and its symptoms are very important. Do regular check-ups and your doctor’s orders religiously. Recording your symptoms and peak flow results will be very helpful for you to identify problems early and prevent severe attacks. Share it with your doctor so he or she can create a good action plan. Partner with your doctor and take an active role in your care. Again, though asthma is not curable, you can help in controlling it better so it will not interfere with your daily activities and disrupt your life.